OXFORD, Miss. 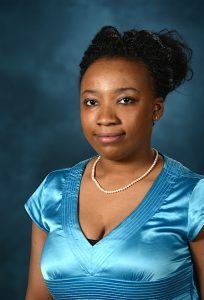 – Jasmine Turner, a fourth-year pharmacy student in the University of Mississippi School of Pharmacy, received a $1,000 grant from the 2016 EPIC Pharmacies student grant program in November. EPIC Pharmacies is a national group of independent pharmacies that annually provides grants to pharmacy students who plan to practice in independent pharmacy after graduation. This is the second year in a row Turner, a native of Tippo, Mississippi, has received this grant. Turner was chosen for the grant based on her application that detailed her pharmacy-related employment, professional service activities and honors, as well as faculty recommendations and an essay about her career goals, which include practicing in an independent, rural community pharmacy. Turner said her desire to work in rural community pharmacy stems from her connection to and care for the people of her small town of Tippo.